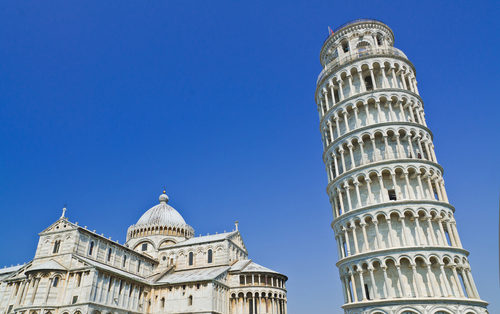 Visit the infamous Leaning Tower of Pisa, the freestanding bell tower that refused to stay straight. Constructed in stages across 344 years, the Tower of Pisa began sinking into the ground almost immediately. Crowds were manageable this time of year. Crowds were manageable this time of year. Easy enough climb. Get your tickets ahead of time. Bring change if you want to use the restrooms. Generally true everywhere. Definitely book ahead of time so that you can maximize your time seeing everything, rather than standing in line. Not only did we see the leaning tower of Pisa but the cathedral & basilica as well. Not only did we see the leaning tower of Pisa but the cathedral & basilica as well. Something very special happens I the basilica each day - amazing! Transport to Pisa with cruise line. Transport to Pisa with cruise line. Then a personal booking for tower itself. Recommend to get best out of this excursion. I had been to Pisa before but had never been inside the tower so this trip appealed to me. Had free time in Pisa to see the Leaning Tower of Pisa and then on to a winery for lunch. There is a long walk from the bus area to the square with the church and tower. Of course you want to see Pisa. Of course you want to see Pisa. Everything there was extra if you wanted to go inside any of the buildings. I enjoyed it. There&apos;s a town around it which you could actually spend more time visiting. Another very interesting tour, with another excellent guide. Another very interesting tour, with another excellent guide. I was not aware of the significance or beauty of the other buildings at the Tower - the Baptistry and Cathedral. Great place, the lucky lucky men did anoy you a bit on the side streets, but I would still recommend. SO AWESOME to climb the Tower of Pisa but you&apos;d better prepare for the climb of 296 steps! Easy Pisa tour, on a small tourist train. Easy Pisa tour, on a small tourist train. Guide described the tour as &apos;herding cats!&apos; and she was right, very funny. Beautiful area, free time at end of tour to shop or drink in the bars. Tight space on small tourist train. Never knew that the “leaning Tower” was actually the bell tower of a cathedral. Never knew that the “leaning Tower” was actually the bell tower of a cathedral. Loved visiting this ancient walled area containing the Baptistry, Cathedral and Leaning Tower and learning some of the history. This was an included excursion. Had a very entertaining and informative half day at Pisa, then relaxed in Livorno after checking out Little Venice on our own. We have visited before but our friends hadn&apos;t.
We have visited before but our friends hadn&apos;t. There&apos;s a market & the tower and accompanying buildings, but unless you want to climb the tower, it&apos;s easy to do in an hour. Took €5pp shuttle to Tuscany tour bus. Took €5pp shuttle to Tuscany tour bus. €70 for 5. A/c coach took us a 10 min signposted walk from Pisa. Beautiful to see. Lovely streets restaraunts and shops all around. Well worth it and very easy. Off ship about 3.5 hrs. Bought tickets online with Tickitaly prior to cruise and was worried that they weren&apos;t going to be valid, but had no issues. Climb up and down took about 45 minutes. Great view of city. Went to Pisa on a coach had about an hour and a half there and then marched back to the coach and back on the ship. Very far walk from the bus parking lot - seemingly other cruisers got a closer parking. We took bus to train to Pisa station and 20 min walk to tower! We took bus to train to Pisa station and 20 min walk to tower! was good! The boys really enjoyed getting pictures with the Leaing Tower. The boys really enjoyed getting pictures with the Leaing Tower. We had Pizza in a little place there that was the best pizza of our trip!